The Smart Safety Solution allows all cyclical SD interface sensor data to be transferred to the cloud. Linking these cyclic SD data within the cloud gives the user comprehensive diagnostics options, including switching cycles, safety status information, tolerance warnings, distance warnings, and much more. The Edge gateway forwards the data in OPC UA format; this is a standardised protocol for M2M communication. 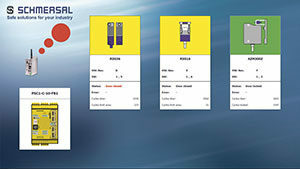 This diagnostic information can be visualised on screen and accessed via mobile devices such as smartphones or tablets. This enables control of production processes which is independent of location. The visualisation of data via dashboards requires, for example, the standard Microsoft Azure Cloud Platform, which offers a range of useful functionality for data display in the form of tables, diagrams and graphics, etc. “This means we can offer our customers a solution which is completely manufacturer and system-neutral and they can choose which cloud they wish to use,” explains Siegfried Rüttger, Project Manager Industry 4.0 at the Schmersal Group.